3-10 March 2014. Groaning our way out of bed at 3.30am we prepare for a 4.25 departure to Quito airport for the flight to Baltra to begin our cruise of the Galapagos Islands. At the airport we receive the sweet news that we’ve been upgraded from a porthole cabin to a ‘Junior Suite’ with big windows. On arrival at Baltra we have a long wait for a bus and a short ride to the dock. We clamber into a rubber dinghy and travel over choppy seas. The dinghy, bouncing rocking rolling on the rough water pulls up to the side of our ship. Men on board hold ropes to keep the dinghy close. Others reach out their hands to pull us up. 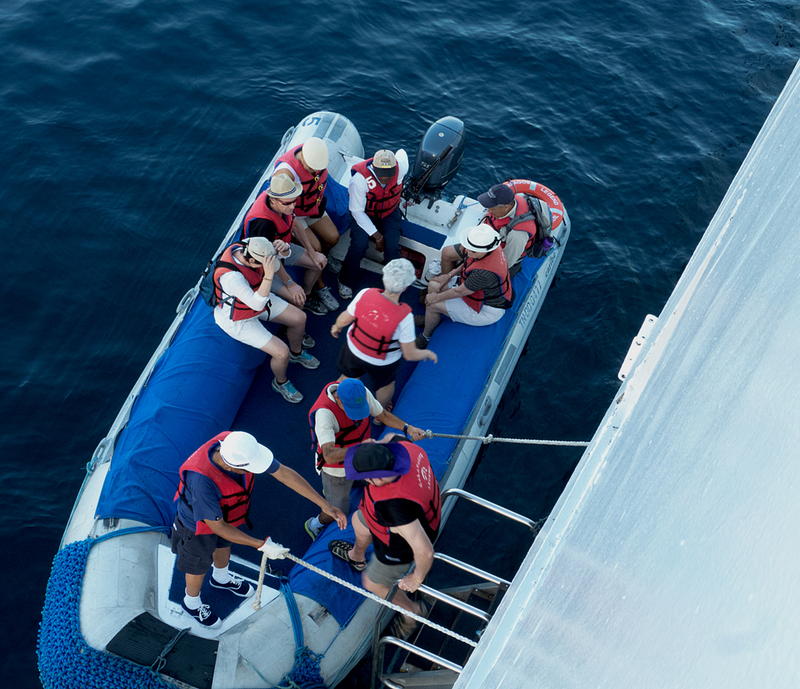 One by one we find balance enough to step up onto the side of the dinghy and then onto the stairs, fiercely grabbing hold of hands and/or railings and pulling ourselves up the three or four steps onto the gently undulating deck of the ship. We have arrived at the beginning of our Galapagos adventure. Our ‘Junior Suite’, home for the next eight days. There is a great variety in the size and style of boats available to tour the islands. We wanted something stable so chose the largest, accommodating one hundred passengers, the maximum allowed, though there are only about sixty on this cruise. We have eight days of exploration ahead of us. But first an excellent buffet lunch, an introduction to the ship by the purser, an introduction to the islands by the head naturalist, emergency evacuation drill, and being fitted for snorkeling gear. and depart at spaced intervals for the short ride to Mosquera Islet, slipping off the side of the dinghy into crystal clear waters and onto a long empty white sand beach. Empty except for hundreds of sea lions. We are amazed. 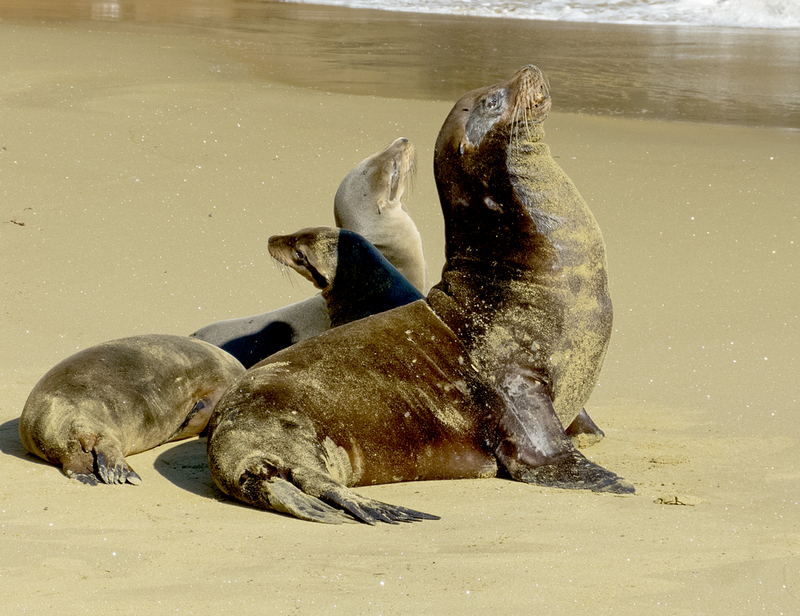 The sea lions are indifferent to this invasion of other beings. 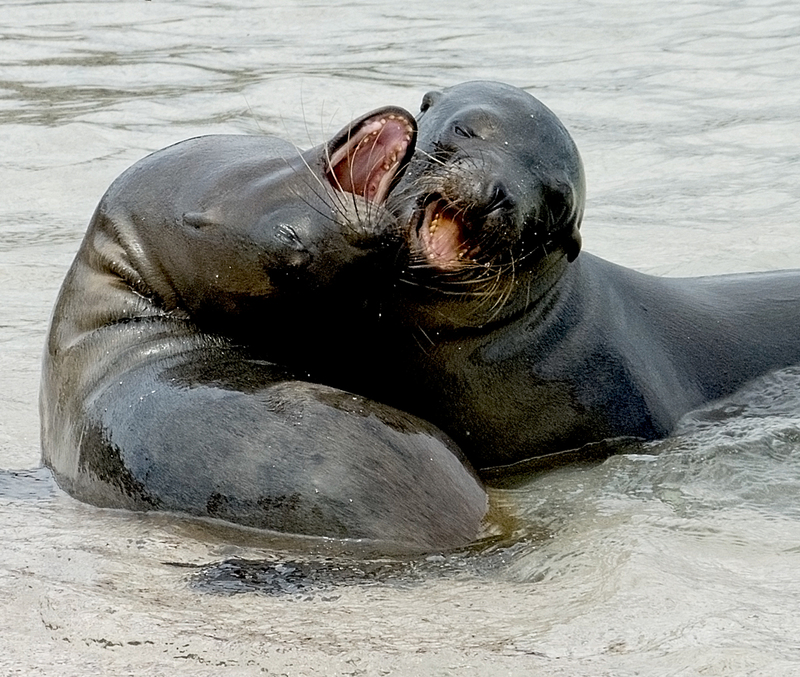 They have never had reason to be afraid of humans so they serenely continue doing their sea lion thing: walking their lurching walk, rolling in the sand, barking, swimming, rolling in the waves, pups suckling or mewing for mum. They are stacked up side by side, rolling around and on top of each other, playing together, soaking up the sun and the water, completely at one with their environment and oblivious to us. 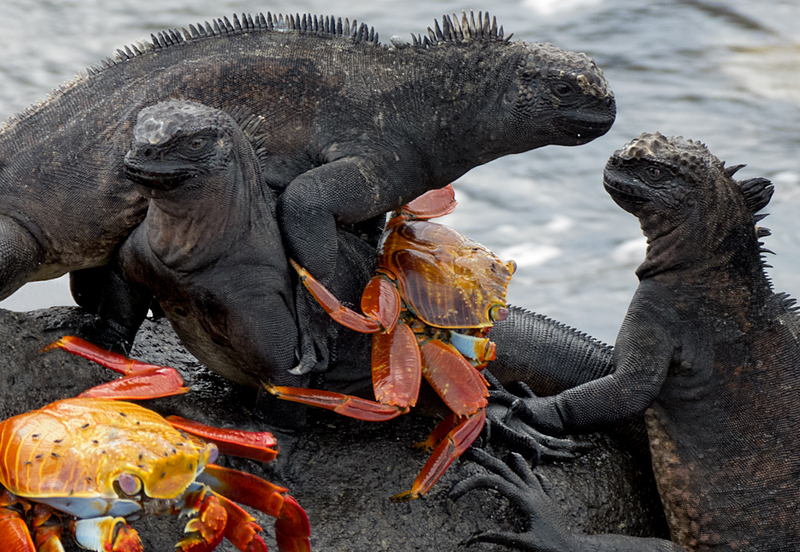 And on the groups of lava rocks dotted here and there along the edge of the water are marine iguanas and the wondrously colourful Sally Lightfoot crabs. 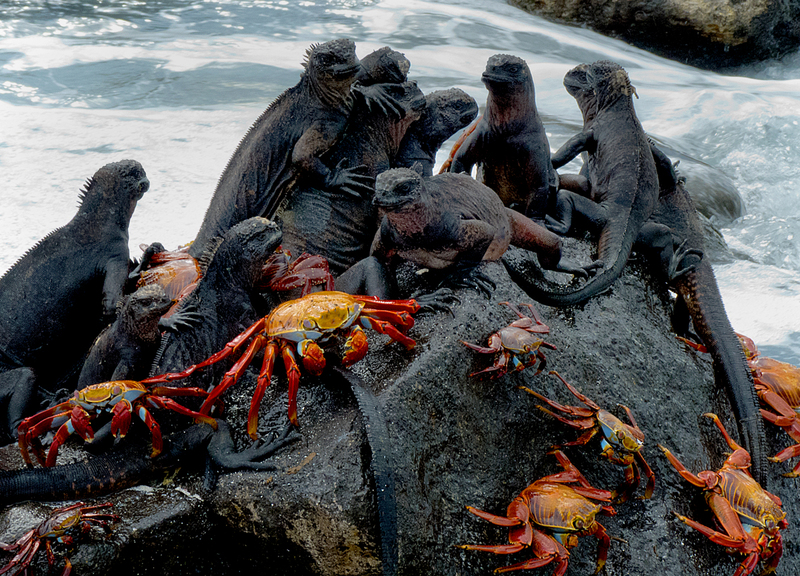 Dozens of iguanas and hundreds of crabs crawling floundering swarming all over each other, clinging precariously to the rocks as the waves crash over them, until there is a wave so big that it washes them all off into the sea. 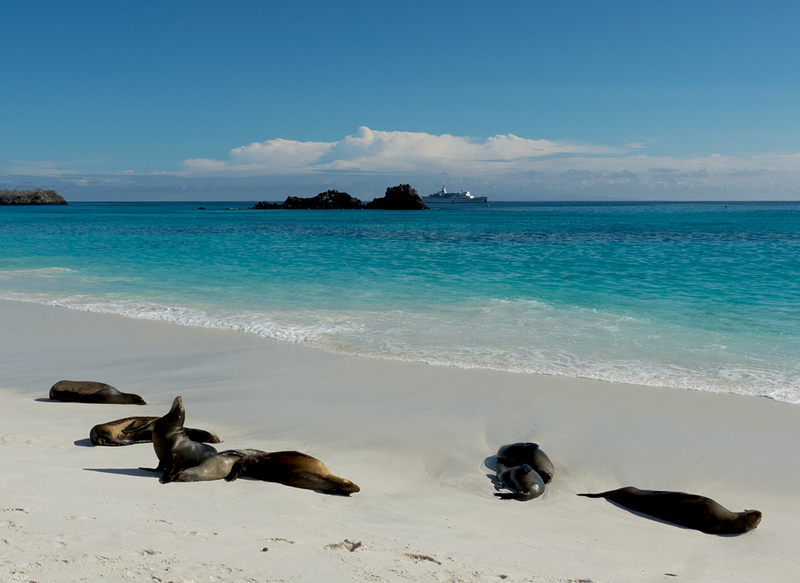 The Galapagos, a volcanic archipelago straddling the equator, consists of 19 islands and over 100 rocks and islets. It lies about 1000 kilometres off the west coast of South America and is a province of Ecuador, a national park, and a biological marine reserve. There are four towns, each on a different island, with a total population of something over 25,000. On the plus side tourism is strictly controlled with visitors given access to only 54 land sites and 62 diving and snorkeling sites. The National Park sets all the cruise itineraries so no two boats are at the same place at the same time. Small groups are allowed to visit each site for only two to four hours and must be accompanied by a licensed guide. On the minus side people have been visiting these islands on and off, attempting various settlements, whalers provisioning their ships, Ecuador sending its prisoners, ever since they were first ‘discovered’ in the 1500’s. They all brought with them many plants and animals not native to the islands that have flourished and are of severe environmental concern. Of course I cannot write a post about the Galapagos and not include a mention of Charles Darwin who first landed here on 15 September 1835. He was on board the survey ship HMS Beagle. He noticed that the mockingbirds differed between the islands, and was also made aware that the same was true for the tortoises. He took many specimens of birds back to England, but it was only after John Gould, the famous English ornithologist, had studied them that Darwin understood their significance. Gould showed that finches too differed from island to island each developing, like the mockingbirds and tortoises, according to their own particular and unique circumstances. This information was critical to the development of Darwin’s theory of natural selection as the guiding principle of evolution. The publication of The Origin of the Species in 1859 was hugely controversial at the time, flying in the face, as it did, of Christianity’s version of creation. On board ship our days unfold in a steady rhythm: a hearty early breakfast followed by a trip by dinghy to an island where we go hiking and/or swimming and/or snorkeling always in close range of wildlife that has no concern for our presence. A sumptuous lunch followed by a rest then another outing to a different island, followed by a four-course dinner with the wonderful company of two American couples and a couple from Taiwan. There is always after-dinner entertainment but we usually entertain ourselves in our cabin with writing, reading, and sorting through the day’s photographs. 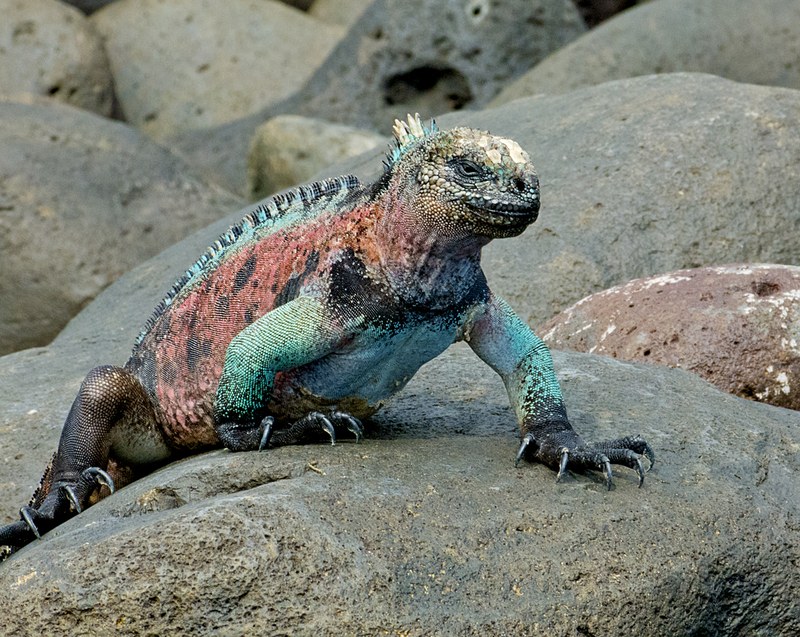 One day we see brightly coloured marine iguanas sunning on the rocks and swimming. On another day, a single Sally Lightfoot crab in all its resplendent glory. 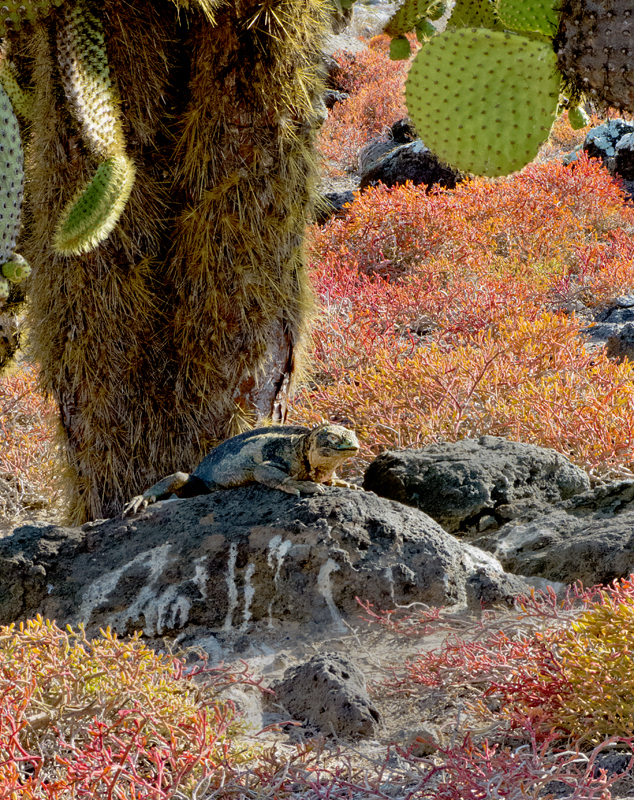 On South Plaza Island we hike through a cactus forest and are surrounded by land iguanas. 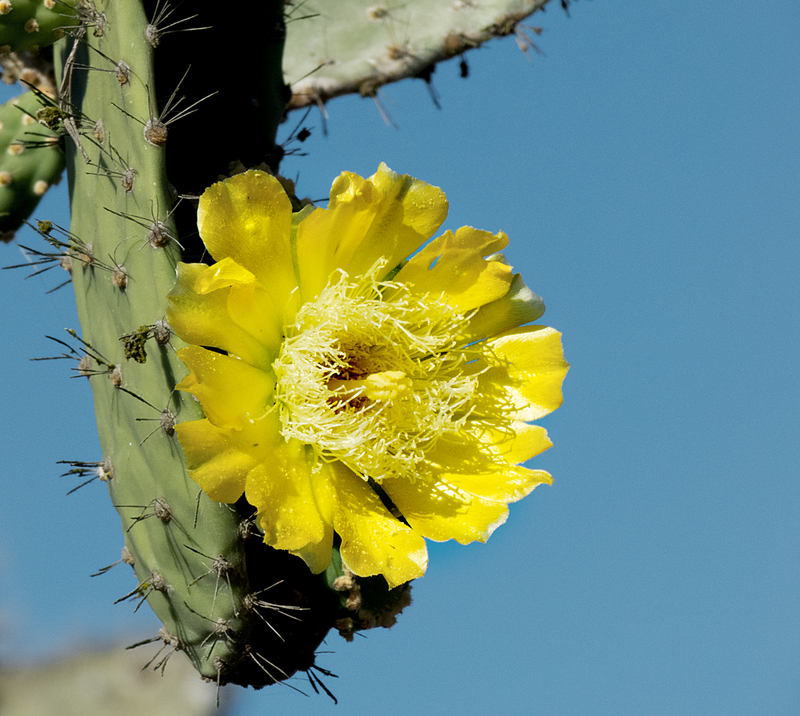 The land iguanas feed on the cactus and are very territorial, each guarding its own tree. We see them again and again, on several different islands and in a great variety of colours. 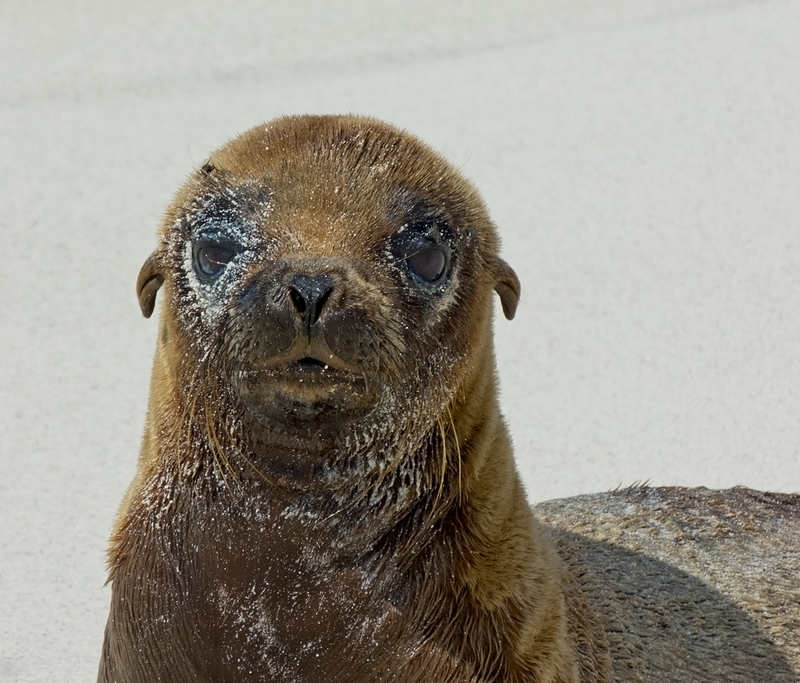 and there are sea lions on every island we go to. Some islands are little more than harsh rock, some are covered in low vegetation, some are forested. 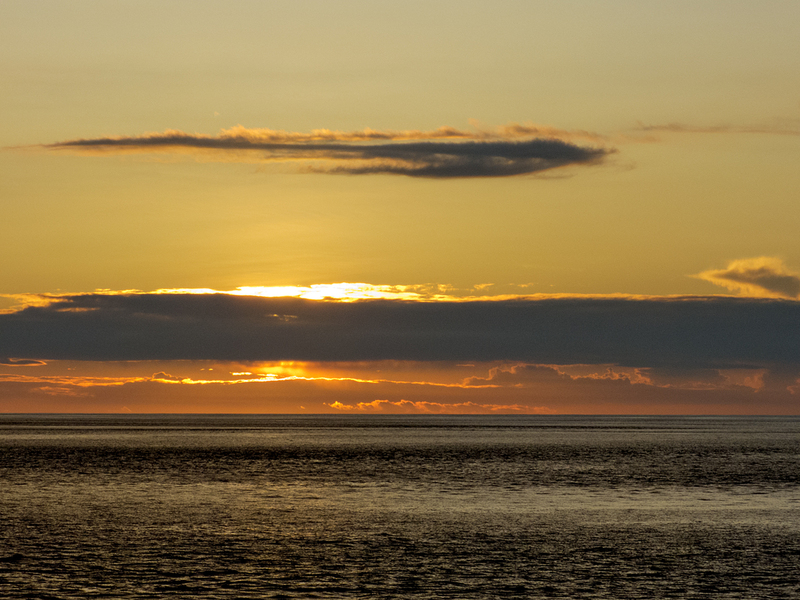 Every evening there are dazzling sunsets. It is a magical time. Every day a new adventure. We are completely enraptured. We love ship-board life. We are astounded and seriously impressed by the detailed organization on the ship so that all our needs are met. We love the tropical climate and the warm clear waters. And we love most of all the close encounters with the untroubled, abundant, beguiling wildlife. It is a magical time. Next post: Oh my goodness the bird life: blue-footed boobies, red-footed boobies, Nazca boobies, herons, frigates, pelicans, mockingbirds and swallowtail gulls. Snorkeling with turtles, sharks, dolphins and angelfish. And of course several encounters with the famous giant Galapagos tortoise. We visited Mosquera Islet, and South Plaza, Santa Fe, San Cristobal, Española, Floreana, and Santa Cruz Islands. Our ship was the Galapagos Legend. 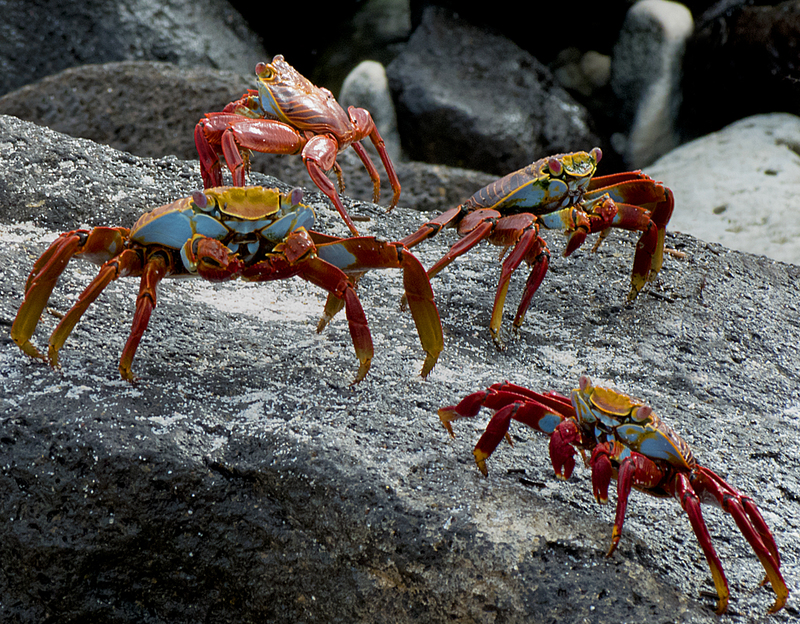 Those crabs look delicious… Gorgeous photos, and what a spectacular trip!!! Thanks Lu. It really was a spectacular trip. Oh haha they looked so large in your photos! I hope I will get to go one day! Yeah, thanks. It really was. Quite extraordinary. What a stunning series of photographs, Alison! I’m thrilled that the wildlife are so undisturbed by the presence of human visitors – it seems like you got very, very close to them. 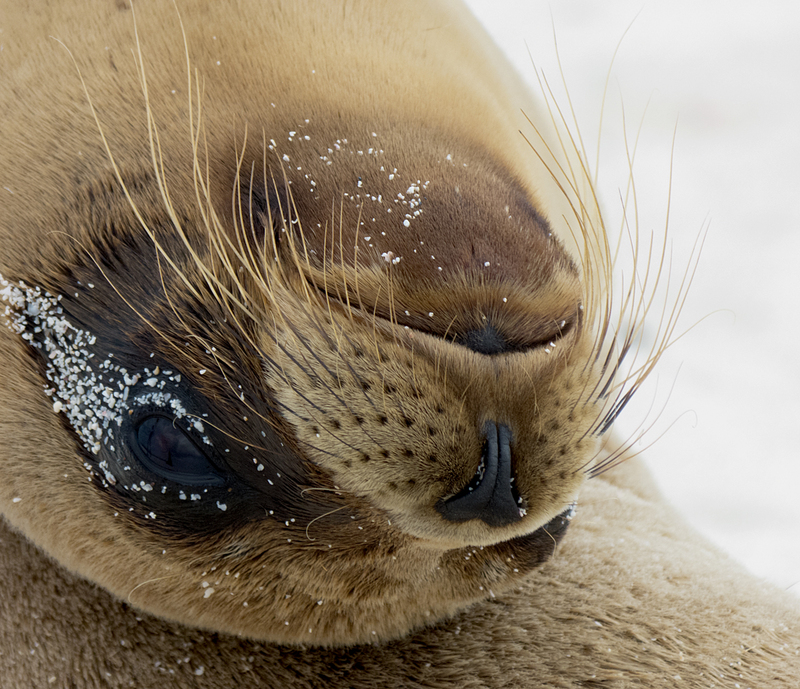 The Galapagos sound heavenly, although the cost of a trip there seems to hold a lot of people back. I’m really looking forward to your next post on the birds and giant tortoises… from your circuit of South America you’ve developed a knack for taking fantastic bird shots! Thanks so much James. Yes, we did get very close to them. The rule is no closer than 6 feet but we did go closer of course from time to time. In the Nazca booby nesting colony they were nesting right by the trail so we had no choice. And the sea lions would come towards you so we’d back off if we could. 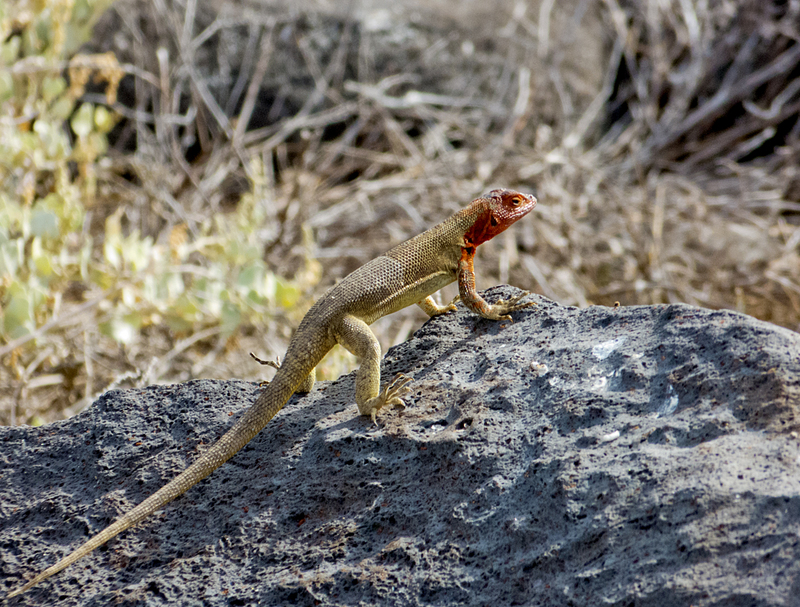 The land iguanas would also walk right towards you – not deliberately so much as just going about their business and unconcerned by your presence. 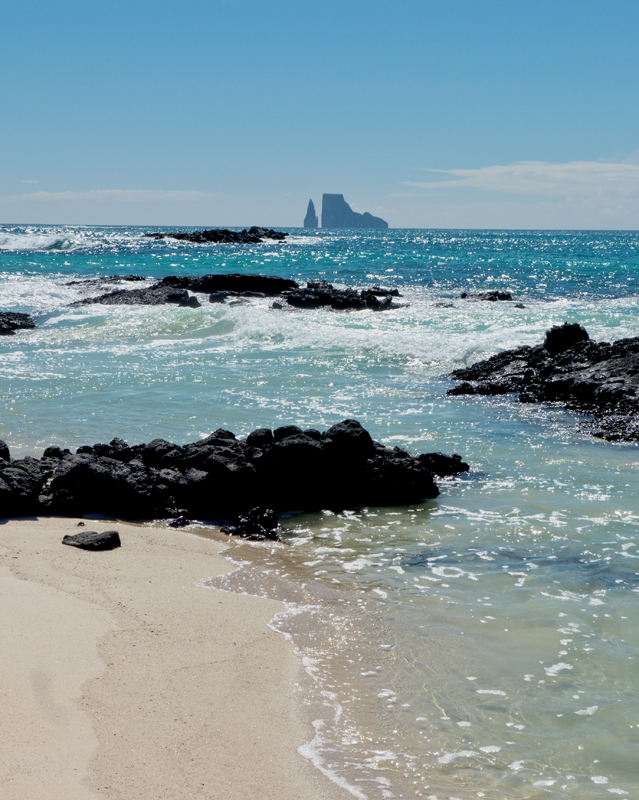 There’s no doubt there’s no cheap way to see the Galapagos – just the cost of the airfare for a start, though once there it’s possible to stay in homestays and hostels and do day trips. Our cruise was about mid-range. Stunning photographs! I’m planning on “doing” Ecuador within the next year (currently in SEA) and would love some details on the ship you chose – name, price, etc. if you’re willing to share. Thanks! Thanks Mary. 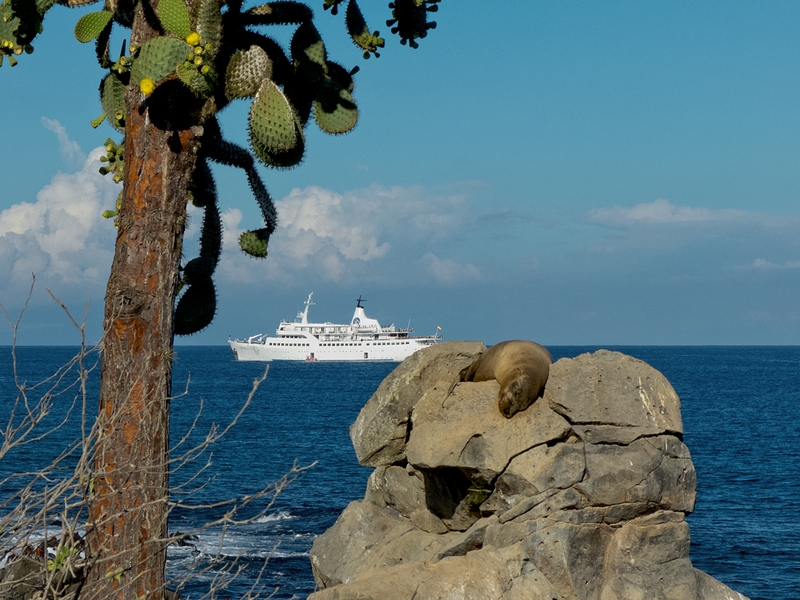 The ship is Galapagos Legend, run by Klein Tours. I was going to put a link to their website but it appears to have been hacked by something Russian. Hopefully they will discover it soon and fix the problem. If you google Klein Tours you’ll get a link to their website, but I’m not sure I’d recommend it. It went to something Russian and I had to shut down the computer. Other than that it doesn’t seem to have done any harm. Fingers crossed. 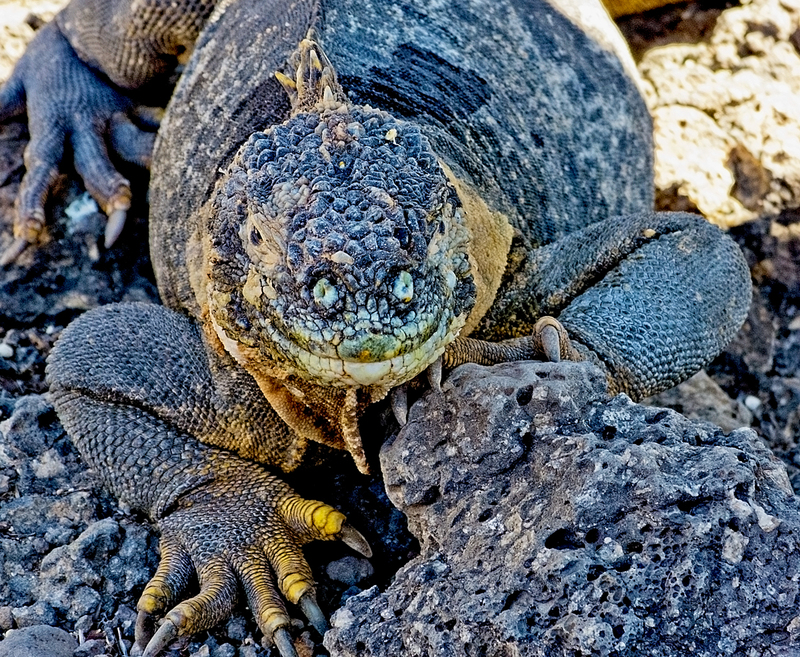 galapagosislands.com is fine and offers many alternatives for tours of the islands. Forgot to say what we paid included return airfare from Quito. Y-e-s-s-s-s-s-s! I am immersed. Give me some smells. 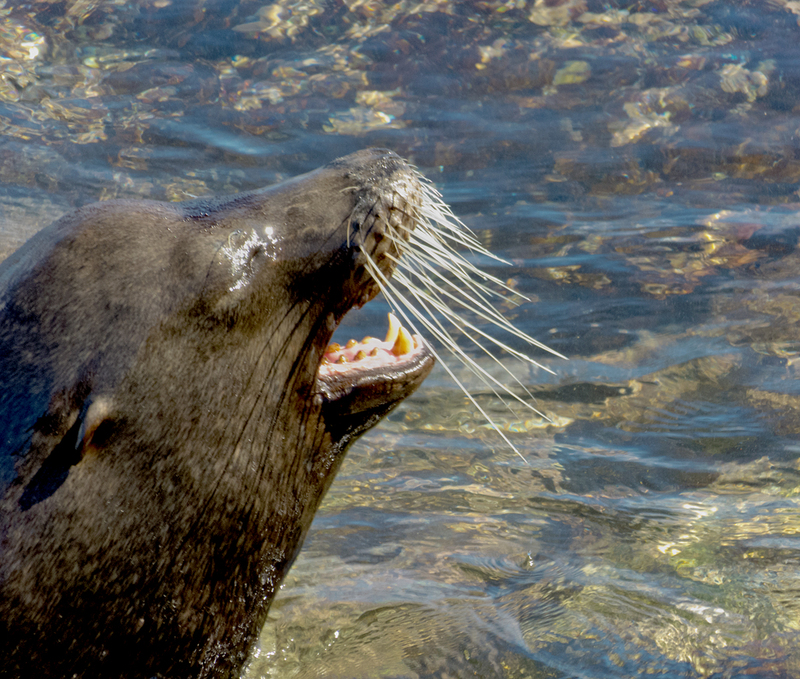 Did the sea lions stink like they do on the Oregon coast? The junior suite, views of the ocean through the windows, smell of salt water? Magical is an excellent word – it’s a magical world. Can’t wait for the next installment — I will be revisiting this one many times. Thank you, Alison. Thanks so much Pam. Finally, eh! I never write about smells. I have a fairly weak sense of smell so it is not a sense that is foremost for me. Right in the background actually. However I can say that no, the sea lions weren’t stinky. 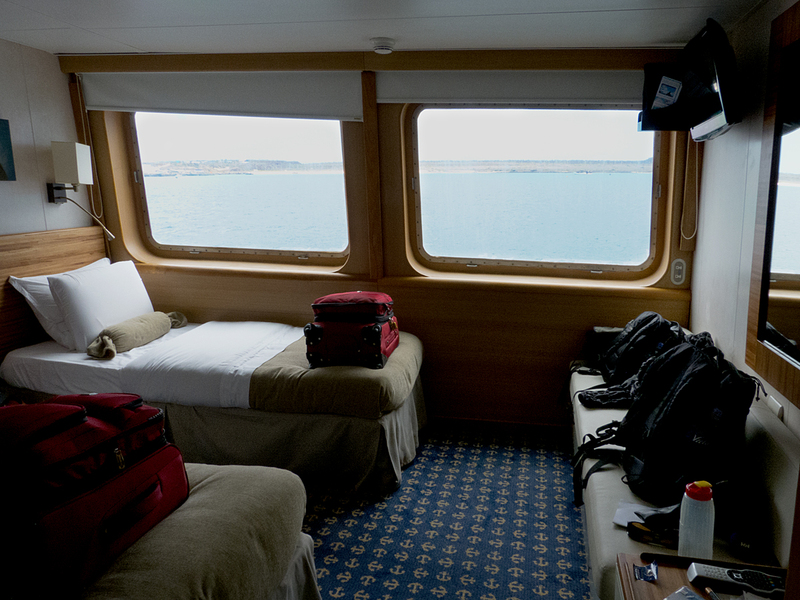 And yes, endless smell of saltwater though not through the sealed windows of our cabin. Magical. Spectacular. Heart-opening. Thrilling. And more. So glad you enjoyed the post. I’ve been fascinated with Darwin ever since learning about him during school days – gotta love a guy who traveled around in The Beagle! 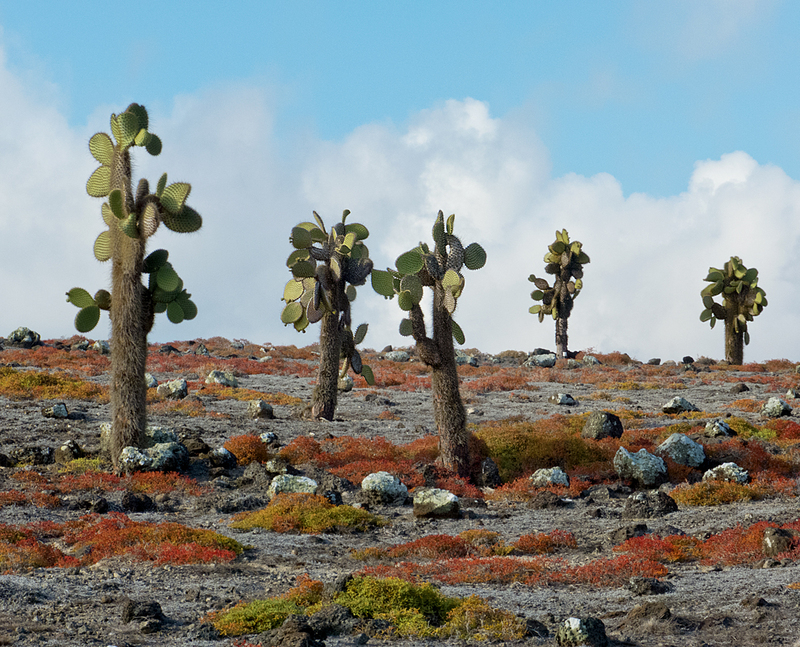 The Galapagos area strikes me as a sort of Jurassic Park – a place lost in time. (Although you did note the encroachment of non-native plants and non-native humans.) Observing animals without the fear-of-humans barrier would be a treat. I will never go there personally – serious motion sickness issues on the ocean – your photo/description of travel via dinghy – ugh. You and Don really travelled for me on this one. It is a kind of Jurassic Park, and they’re doing all they can to preserve it. Yes, incredible. And when I was in my twenties travelling in Sth America I couldn’t afford it either, but do go in the future. It really is special. Thanks for taking us along with you on this amazing adventure. I love the pictures and can’t wait for more. That was truly was an incredible read and visual, Alison! Beautifully captured photos. Thank you so much. It’s a really extraordinary place. I feel so fortunate to have been able t go there. Oh, Alison, you have outdone yourself this time. A question about the lizards: how big are they? In the close-up photos it was hard to tell. Thanks Fiona. It’s such an amazing place. Everyday we were completely gobsmacked! The lizards are only about 5″ in the body, and another 5 of tail. 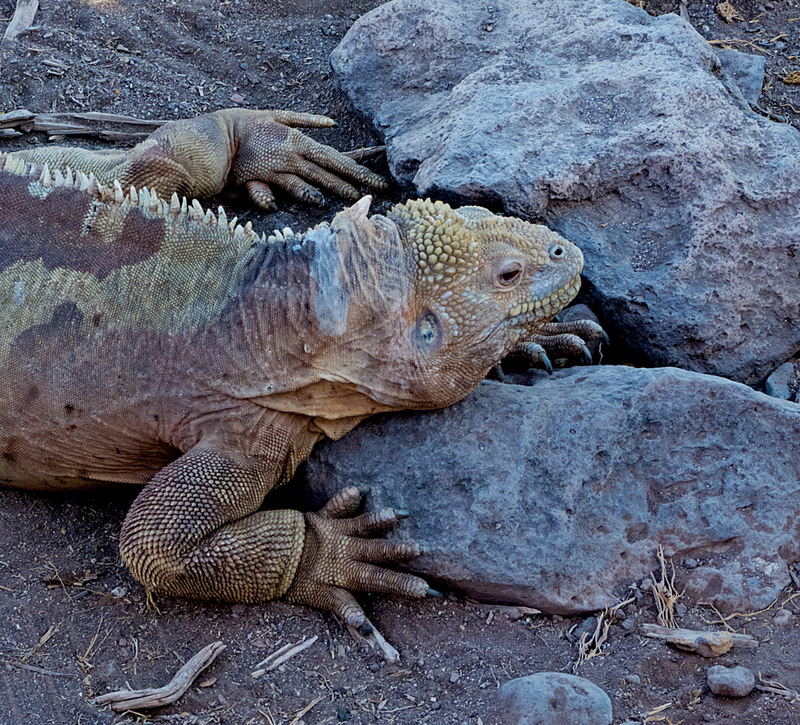 The iguanas are bigger and fatter – 3 to 5 feet with body weight of up to 25lbs. 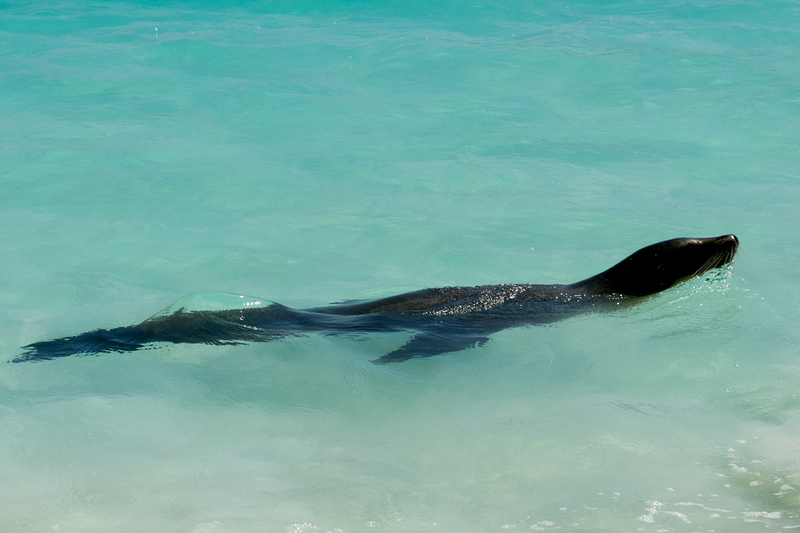 Gorgeaus pictures, I need to plan to go to Galapagos to see them myself…. Thanks Nina. Do go! It’s really extraordinary. We just might show up in Bali next March/April – are you likely to be there? Incredible images and beautiful write up. I haven’t seen such colorful crabs in my life. Thank you Sreejith. Yes, we did have a great time – really special. And so are those crabs! I hadn’t seen anything like them either. Thanks Paulette. Yes, it really was a wonderful trip. Definitely one of the highlights of South America. Finally! I’ve been waiting to go with you to the Galapagos for months. 🙂 What an incredibly vibrant place – the colors, the wildlife, the decadence of your tour. I can’t afford the islands yet on my budget either, but your photos are moving it upwards on my bucket list. And in the meantime, I get to look forward to your next post! Awesome photos. 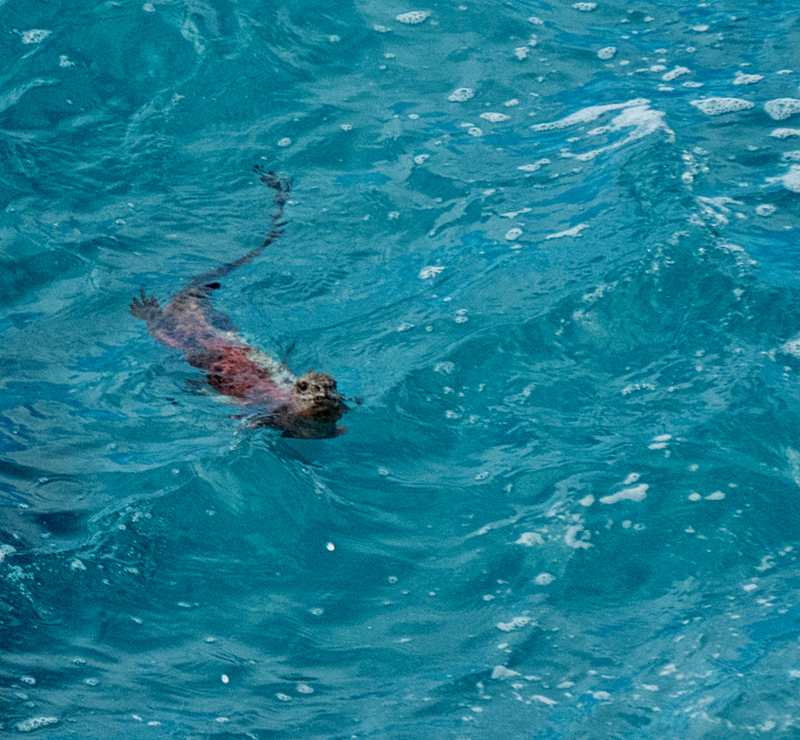 I can only dream of coming to the Galapagos! The cruises are expensive. Thanks Lee. Yes the cruises are expensive but there are other ways – but no way around having to fly there. It may be less from Guayaquil than from Quito. Also there’s a $100 park entrance fee. Once on the islands there are 4 different towns you can stay in that I think have hostel/homestay accommodation and you can take day trips from the towns to different islands. I haven’t looked into the cost of doing it this way but I’m fairly sure it will be a lot less than what we did. Thanks so much Curt. Yes, you’re allowed to be jealous 🙂 – but you two get yourselves to South America stat! Alison as always your photos are stunning! 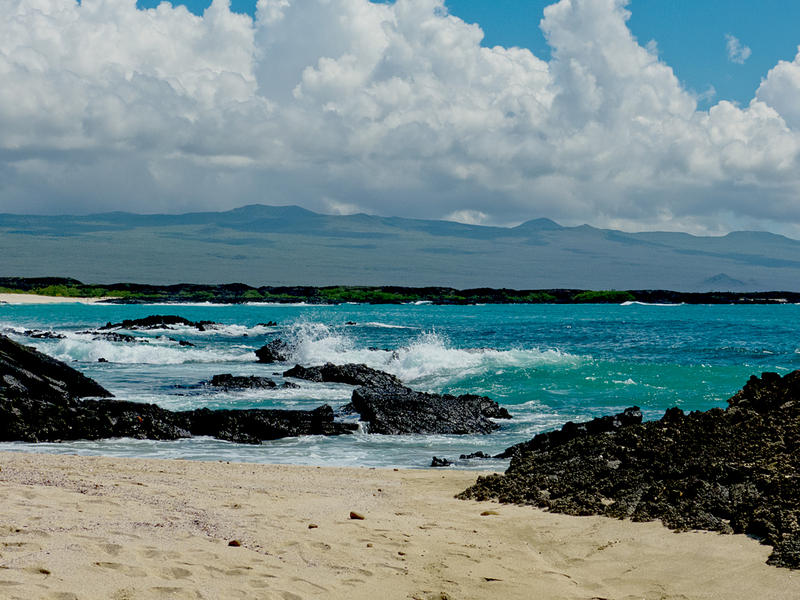 We’ll have to seriously study our RTW budget and allow for the Galapagos! Thank you so much Ginnette&Gordon. I really recommend going – it’s one of the most extraordinary and unique places on earth. Thank you very much. I’m so glad you enjoyed it. 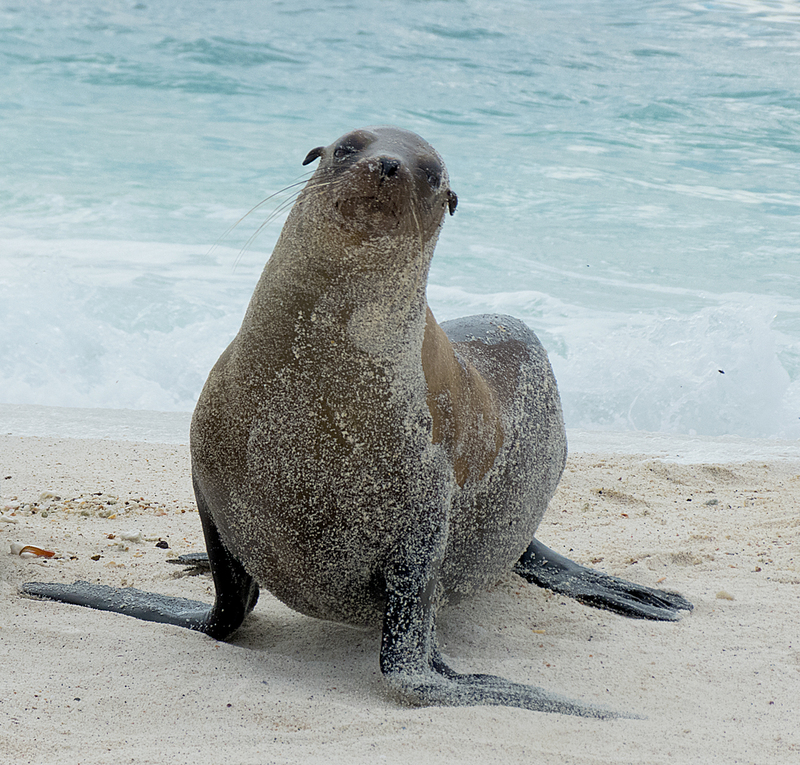 The Galapagos were even better than we expected. A really fabulous experience. Thanks sb. Thanks for dropping by, and for following. I’m glad you enjoyed the post. 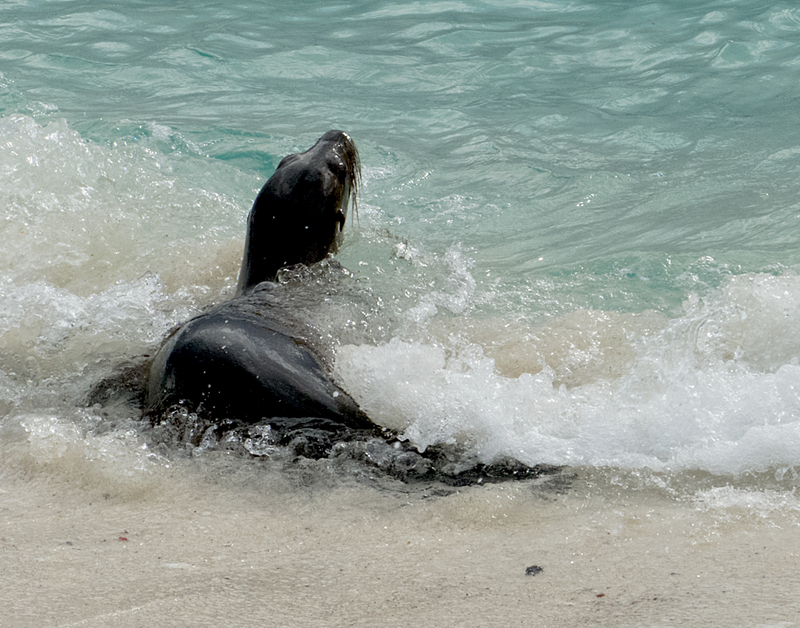 Galapagos really is amazing, a world unto itself, like no other place on earth. Aren’t those crabs amazing?! We loved them. Also the blue-footed boobies coming up in the next post. ohh!! please do update me as soom as you do that! Waiting in anticipation 🙂 hi5! these photos are stunning. I have just started my blog about moving to Germany and after having seen these photos I have bought a much better camera to document like you 🙂 love this post, I live on a small island too but it looks a lot different.. ha! Thank you so much Jennifer. Yeah, your island *is* a bit different lol. I’m ready for a camera upgrade myself. BTW you’ve made a great start on your blog. Thank you so much Mo. I really appreciate the reblog, and your kind words. Thanks so much re the photos. Three weeks there! How wonderful. I imagine it must have been an incredible experience. I’d love to have 3 weeks there. Still I realise we’re hugely blessed to even get there at all so I will not complain! 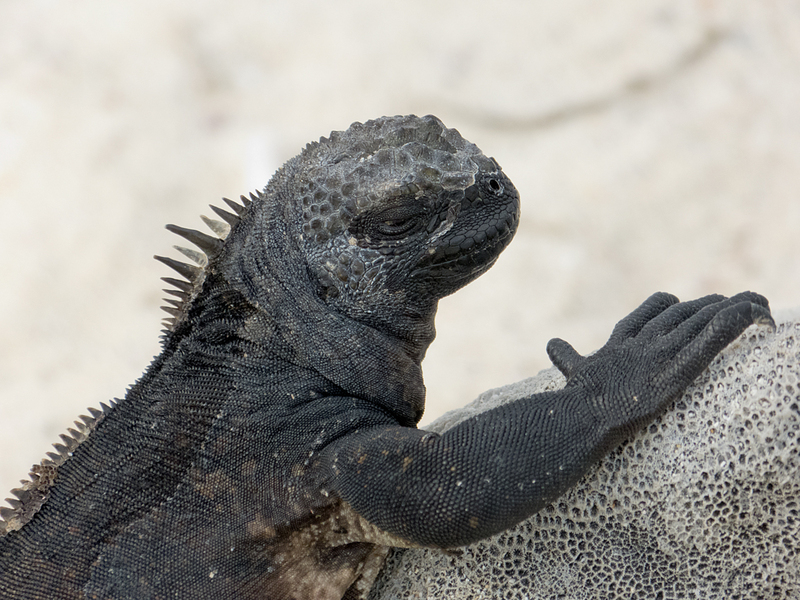 Those marine iguanas on the rock seem to have the faces of ancient beings who decided to hang out on a tropical island and soak up the good life for a while. They definitely seem to know something I don’t. They crack me up on the one hand, as they look like a big pile of selfless, utterly pure, hair-trigger, take-one-more-step-and-see-what-happens intensity who simultaneously couldn’t be bothered by the crabs crawling all over them. But a couple of those close-ups wound me on the other hand. The eyes seem old, ancient, pensive, enduring. Amazing. Unreal! You are so blessed. Yes, you are right, we are so blessed. The logistics for the cruise we chose were fine tuned to the last detail. There are smaller boats, and because the itineraries and access points are so controlled I imagine it would be the same with them. Thanks for the wonderful post! 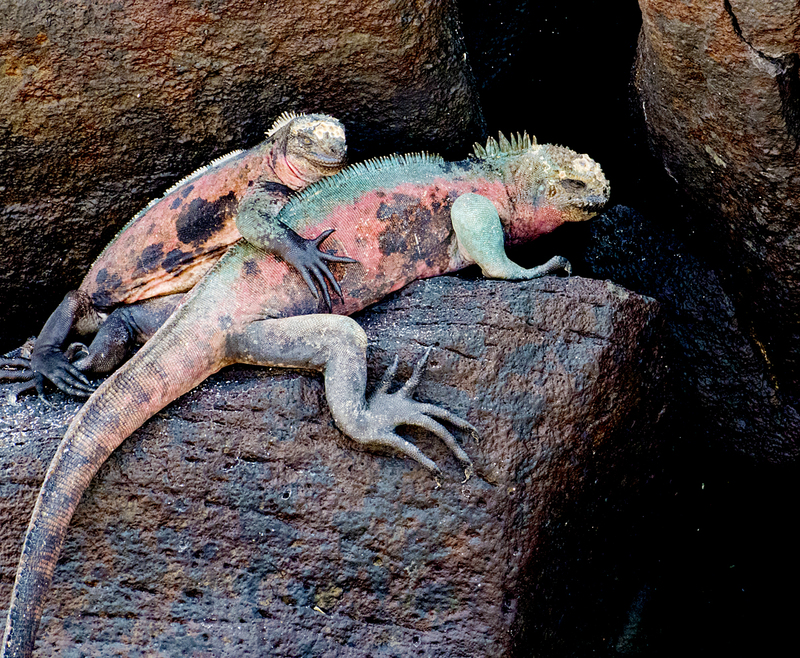 I particularly enjoyed the photos of the multi-colored iguanas. 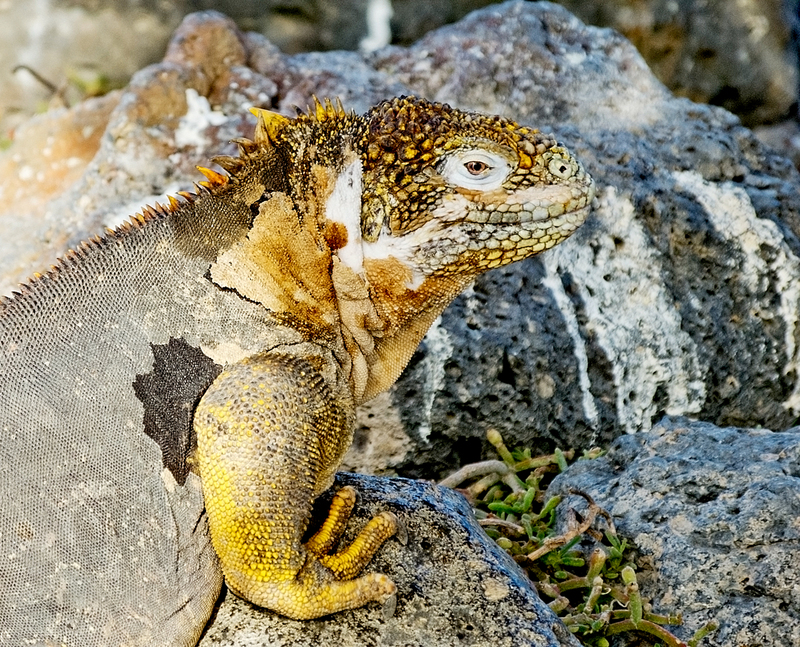 Who knew that iguanas came in colors like the rainbow? It sounds like a fantastic trip. Thank you so much. 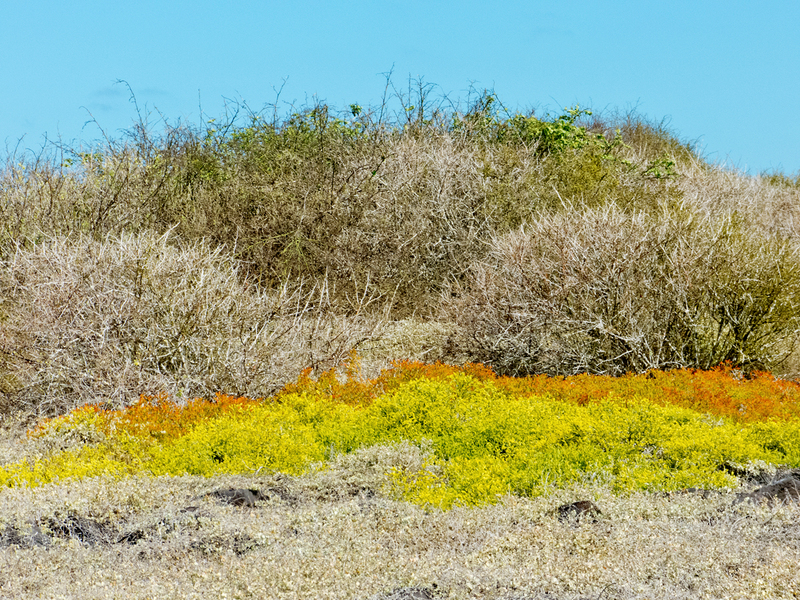 We were surprised by the iguanas too – so much unexpected colour. And yes, it was a fantastic trip; extraordinary in so many ways. This was even more incredible than I thought it would be – what an immensely exotic place. The variety of lizards are amazing and the crabs are just gorgeous – never thought I’d say that about a crab! Amazing tour, photos and experience! Thanks Andrea. Isn’t it all amazing?! We were totally blown away. 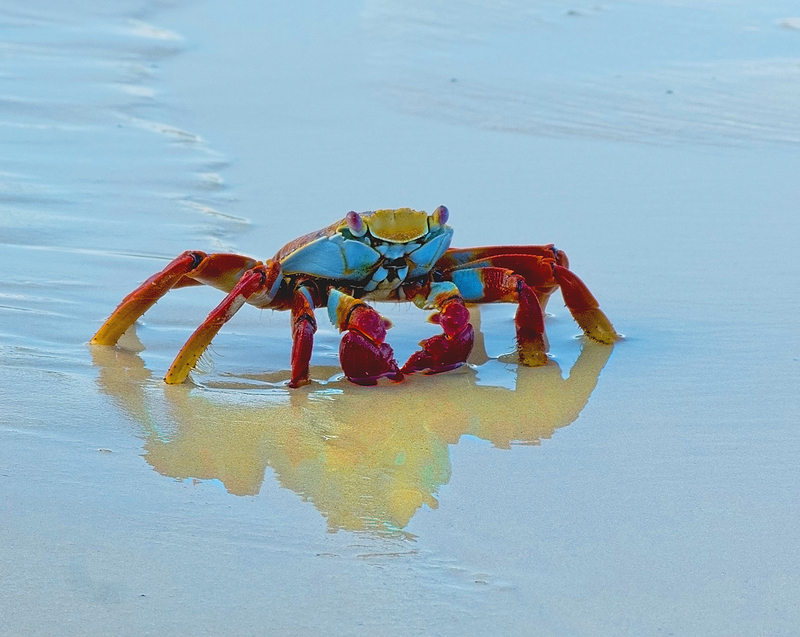 I love the crabs – such beautiful colours. Thanks so much Alisha, and you’re welcome. Glapagos has been on my list for about 30 years. I think I first heard of it in my 20’s on my first visit to Sth America but couldn’t afford to go then. 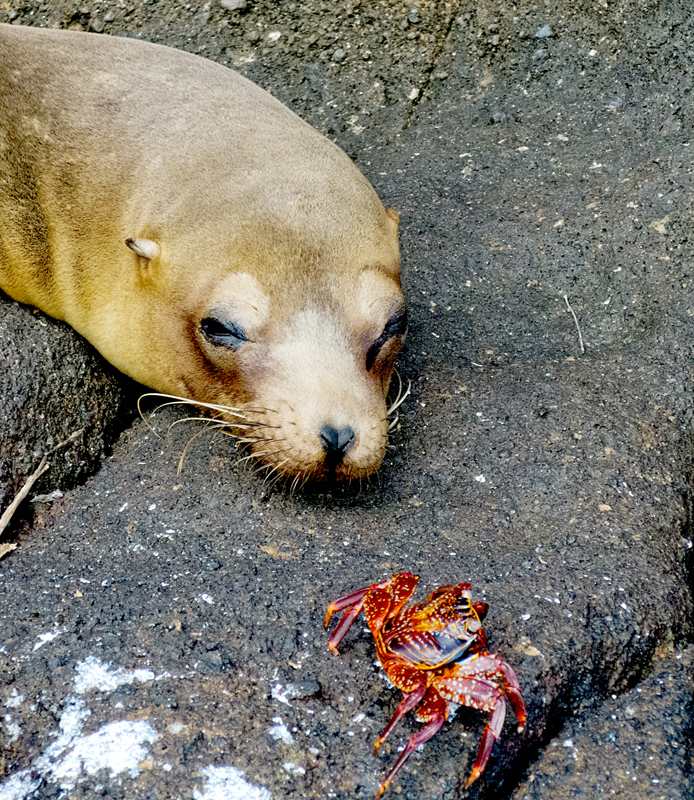 The next post is about Galapagos too. Your photos are magnifique! And the travelogue is fascinating! You’re welcome. Isn’t it fabulous?! We were so totally gobsmacked by everything we saw. The trip of a lifetime for sure. It really is beautiful. And the unafraid wildlife something you couldn’t imagine. 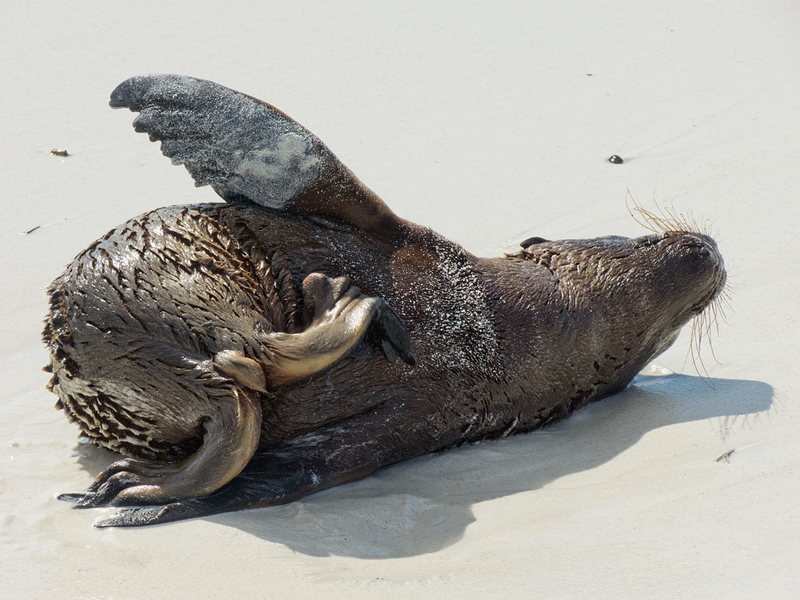 We’ve heard there’s an IMAX movie of Galapagos – on the lookout for it. Would love to see it. Lovely photography and the words match perfectly as well! Thank you so much. It’s a magical place, you must go!